So not long ago I took a day where my best friend and I ran away for a few hours. We wandered through little shops and meandered around looking at antiques that were hidden away in nooks and crannies. It was great fun for us and we were silly and goofy as we laughed our way through town. Then, all of a sudden, I came upon an item that was grossly out of place. It did not belong. It was so wrong that my whole being revolted! 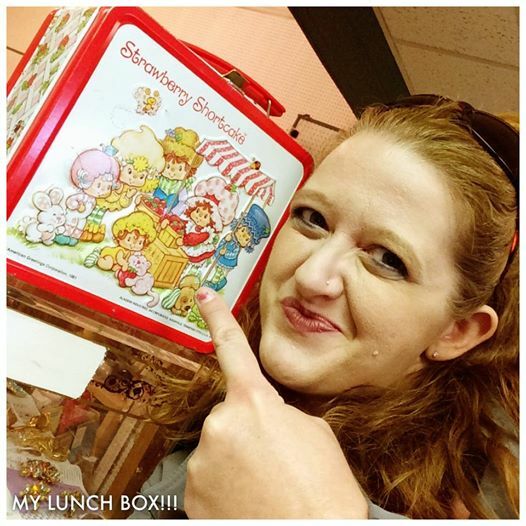 It was THE exact lunchbox I carried as a child! I was probably about 7 or 8 years old and in elementary school in Lynn, Indiana. I lived in a tiny little town next door called Spartenburg. The town was just a bitty little thing, just as I was, with only one stop sign in town. I can remember the place and time well. So well time stands still like photographs in my mind. I can remember moments on the bus, the playground, and playing in the sandbox in the yard. I clearly remember learning to ride my bike on the big hill and riding down the road by the house, with a ditch full of prickly stickers, so it was best not to run yourself into it. I remember the park down the street and the creek at end of our yard, the latter f which was forbidden to go off and play in alone, though my brother and I regularly did just that. I remember so much it is just not possible that it was so long ago that it was an antique long time ago. I just CAN’T be that old! What’s that you say? It’s painful when you get to be this age? That 39 is old enough that things can be seen as “collector’s” items regardless of whether or not I remember the days of that time well or not. I don’t think I like hearing what you have to say! Ah well – I didn’t spend the money to relive my childhood, but I did capture the memory. It took me a long way back and it was certainly worth the shock to take the trip back to my childhood home. It was such a sweet memory.